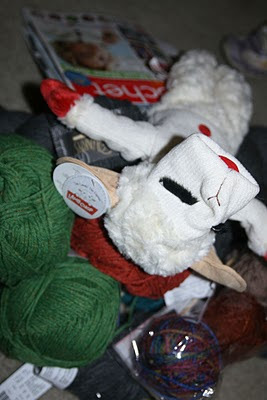 I felt like Lambchop after my day at Stitches West! This year at Stitches West I went with a list of yarns to track down for projects I want to make. This made wandering around and spending stash money wisely. In the years gone by I have just gone wild and bought so much random yarn and it still sits in my stash today. So I wanted to make a cardi from Haiku Knits called snowflake which is coming along nicely. Also I needed a cable project I wanted to tackle for a hat so I found the Debbie Stoller bamboo yarn and I’ll try the Cabled Chapeau. Other yarns that I scored were Berocco Remix and Flicker. Remix is for my crochet animals and Flicker well it is 87% baby alpaca with a silver yarn through it – so it will be a new neck pet!